What Is a Salt Water Disposal Well? The process of oil and gas production creates "salt water," which is considered a hazardous waste because of its high salt content, hydrocarbons, and industrial compounds. Hydraulic fracturing of shale gas well sites produces millions of gallons of this salt water, also known as "produced water" or "oilfield brine." The water brings oil and gas to the earth's surface where impurities are chemically removed, resulting in leftover liquid that must then be safely discarded. Companies can recycle the water, injecting it back into working reservoirs for reuse in gathering any remaining oil or gas, or they can discard it at a salt water well disposal site. Placement of these high-pressure disposal sites can be a controversial issue because of the potential for groundwater contamination and small earthquakes. The Environmental Protection Agency (EPA) describes a salt water disposal well as "a bored, drilled, or driven shaft whose depth is greater than the largest surface dimension; or, a dug hole whose depth is greater than the largest surface dimension; or, an improved sinkhole; or, a subsurface fluid distribution system." Widely used since the 1930s, salt water disposal wells contain the water so it can't contaminate land or water resources. Initially, the salt water was largely disposed of in surface waters, but it has been captured in deeper wells since the 1950s. They're mighty fortresses designed to spare the environment the effects of gas and oil production, and each state imposes its own regulations on salt water disposal wells as well. The EPA requires that wells intended to dispose of carbon dioxide or other hazardous wastes be constructed of as many as three layers. The first outer layer extends as deep into the ground as necessary to protect area groundwater. It's typically constructed of steel pipe and cement. Another layer covers the entire well, and a third encloses the injection device. This triple-layer system means that all three protective coverings must be breached before contamination of surrounding groundwater can occur. The EPA categorizes all salt water disposal wells into six separate classes based on their construction and their operating features. Salt water is typically ejected from the wells into natural underground formations sealed within impenetrable rock to prevent the salt water from escaping into surrounding soil and groundwater. These formations are commonly deep beneath the surface soil layer and are comprised of limestone or sandstone. The Environmental Protection Agency keeps a close eye on these salt water well disposal sites and it’s not an easy job. 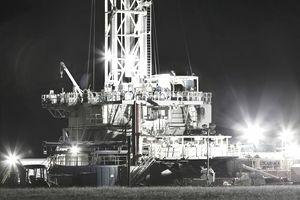 More than 50,000 well sites exist in Texas alone. Individual states and tribal governments can request “primacy” or the right and responsibility to enforce regulations within their jurisdictions if they meet federal UIC requirements. As of October 2015, 33 states and three territories have qualified for primacy The EPA regulates salt water disposal wells through its regional offices in 10 other states and for most tribes, as well as the District of Columbia and two U.S. territories. It shares responsibility for enforcement with local agencies in seven states. The Safe Water Drinking Act, passed in 1974, requires that the EPA maintain minimal federal requirements for the practice of salt water disposal and regularly report on them to Congress. How Dangerous Is the Waste Water From Fracking?